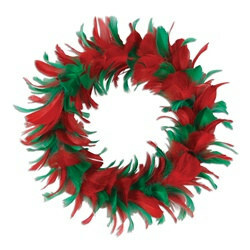 Decorate your front door this Christmas with the Red and Green Feather Wreath. Each wreath measures 12 inches. You could also use this Red and Green Feather Wreath as a festive table centerpiece by placing a pillar candle in the middle of the wreath. One Red and Green Feather Wreath per package.